"Jeanne M. Santelli, Westbrook College, Class of 1975"
Westbrook College student Jeanne M. Santilli, Class of 1975, was a Nursing major and lived in Hersey Hall. 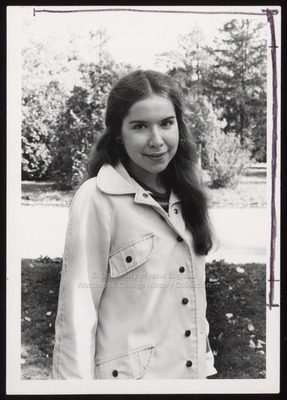 For her senior class candid photo, which appeared in the 1975 Tower Yearbook, she wore a white, or off-white, jean jacket over a bright poor boy sweater. Her hair was long, dark, parted in the middle, and pulled over her left shoulder. Jeanne stands in front of a small stand of trees.